The month almost got away from me this time, but I'm here just under the wire with this month's edition of Wendy's Favorite Things. 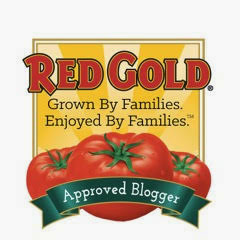 This month I'm sharing some sweet treats, healthy snack ideas...and a few other fun surprises. So...let's get started! (1) Cosmos Creations Premium Puffed Corn. If you're searching for a crunchy snack you can feel better about eating, then you HAVE to give Cosmos Creations a try. I recently discovered these crunchy corn puffs, and I absolutely love them!! Not only do Cosmos Creations taste great, they're al trans fat-free. Since they're made with non-GMO corn, they're also naturally gluten free. 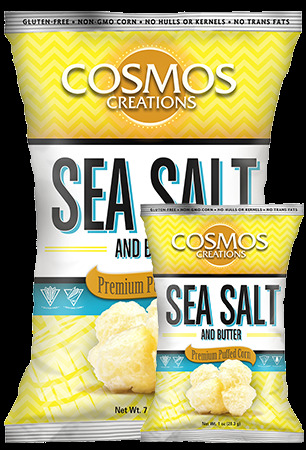 Cosmos Creations comes in a variety of sweet and savory flavors, including Spicy Sriracha, Salted Caramel, Cheddar and Pepper, and my personal favorite: Sea Salt and Butter. I can't get enough of its buttery, salty flavor! Unlike traditional popcorn, Cosmos Creations has no hulls and no kernels to contend with. Because it's all natural and has just 160 calories per 2.5-cup serving, I love to enjoy it for at-home movie nights. To find Cosmos Creations near you, check out their Store Locator. My Texas readers can find Cosmos Creations at Central Market. (2) Full Spirited Flavours Cakes. I recently tried Full Spirited Flavours' liquer-infused mini cakes, and I was immediately impressed with how moist and flavorful their cakes are! Full Spirited Flavors is a Pennsylvania company owned by a trio of sisters, and they're products are simply fantastic. 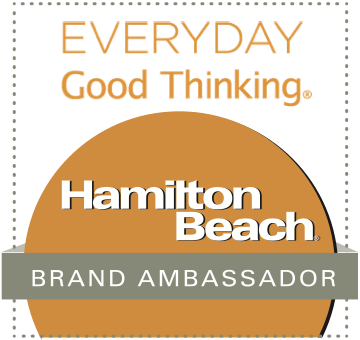 Their four signature flavors are Limoncello, Amaretto, Chocolate Raspberry, and Mango Coconut Rum. The cakes come in a variety of sizes, but the Bloomin Blossoms sampler is a great way to try all four signature flavors. 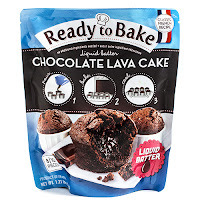 Each mini cake is individually wrapped, and they are easy to eat. These boozy little cakes are VERY moist, so make sure to have a fork handy! 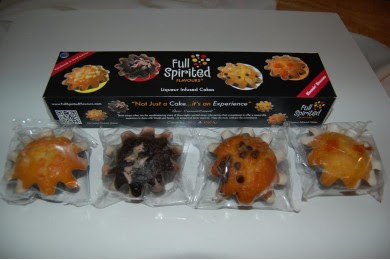 Full Spirited Flavours cakes can be purchased via their convenient online store. 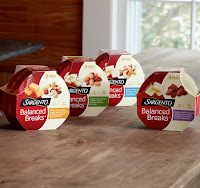 (3) Sargento Balanced Breaks. I'm always looking for filling snacks that I can enjoy at my desk when the mid-morning or afternoon hungries hit. Sargento Balanced Breaks have been one of my go-to snacks lately. They come with three individually portioned snacks packs per package. 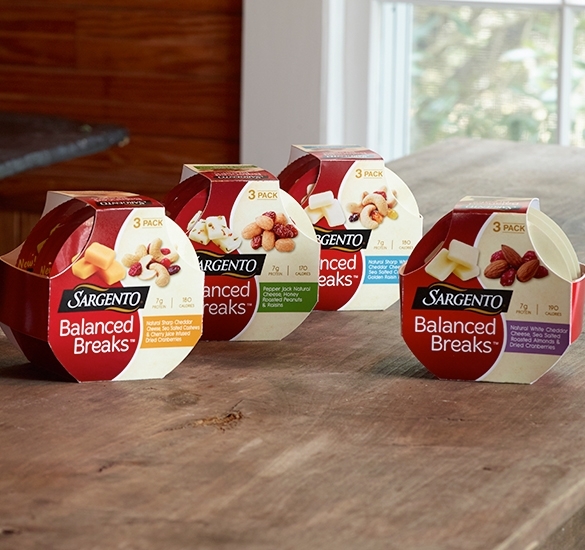 Balanced Breaks include flavorful Sargento cheese, along with nuts and dried fruits. Each snack pack has less than 20o calorie and provides 7 grams of filling protein. Sargento Balanced Breaks come in four different varieties, but my personal favorite combination is Natural White Cheddar with Almonds and Cranberries. The combination of sharp cheddar, sea salted almonds, and sweet-tart dried cranberries is perfect. To find Sargento Balanced Breaks near you, simply visit Sargento's Store Locator. (4) L.A. Burdick White Drinking Chocolate. 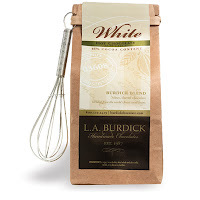 New Hampshire-based L.A. Burdick Chocolates offers a wide range of decadent chocolate treats, but I was recently introduced to their decadent White Drinking Chocolate. The resulting beverage is like cocoa on steroids -- it's rich and creamy, with warming vanilla undertones. 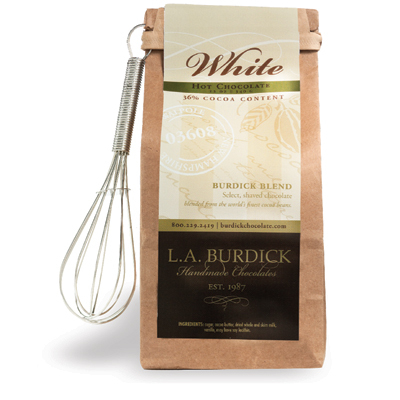 It takes just a few minutes to make L.A. Burdick's White Drinking Chocolate, you simply add a bit of the shaved white chocolate mixture to your favorite mug. Then, use the provided whisk to combine with 1 cup of warm milk. I love to top with a bit of whipped cream and a dash of cinnamon for an indulgent treat. L.A. Burdick's drinking chocolate also comes in milk and dark chocolate varieties to please every chocoholic. I'm thinking this drinking chocolate would be a perfect holiday gift for the chocolate lovers in your life! L.A. Burdick Drinking Chocolate can be purchased via their website. (5) Dr. Lucy's Cookies. When Dr. Lucy Gibney found out her child had severe food allergies, she went into the kitchen to create cookies and other treats her child could enjoy. Dr. Lucy's Cookies is the result of her kitchen creativity. 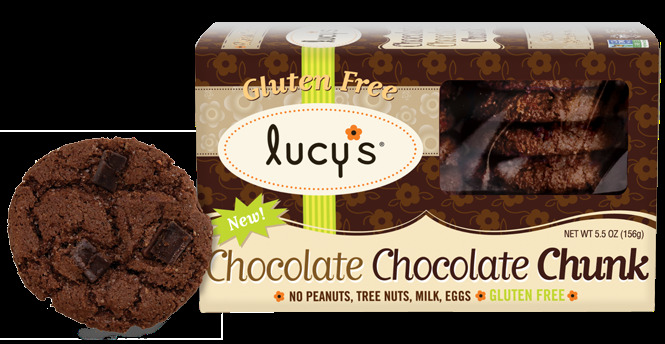 The cookies are gluten free and contain no milk, eggs, peanuts, or tree nuts. That means they're low in allergens...but you don't have to have food allergies to enjoy these delicious cookies. I absolutely love these crunchy cookies! The new Chocolate Chocolate Chunk flavor was especially good. I couldn't stop eating them after tasting their deep chocolate flavor. 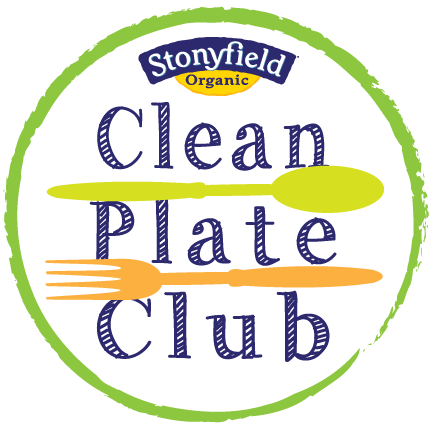 Each three-cookie serving has 150 calories and 2 grams of healthy fiber. 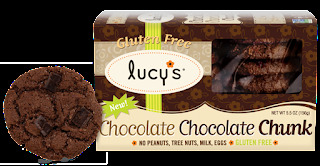 Dr. Lucy's Cookies can be found a major retailers nationwide, including Target and Whole Foods. (6) Sukkah Hill Spirits. With the holidays right around the corner, you're likely going to be doing more entertaining. If you're looking for something new to add to your cocktails, definitely check out Sukkah Hill Spirits! These artisanal hand-crafted liqueurs are made with premium, natural ingredients. They can be enjoyed on their own -- or can be used as a component in creative cocktails. Sukkah Hill Spirits are all natural and come in two flavors: Etrog and Besamim. Besamim features warm spice flavors of vanilla, clove, and cinnamon. It tastes great added to coffee for an after-dinner drink -- and I'm thinking it would be a fabulous addition to the typical holiday egg nog! 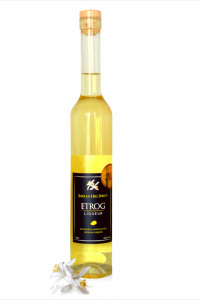 Etrog was rated 91 points by Wine Spectator magazine and features bright citrus flavors of honey, herbs, and lemon blossom. My favorite way to enjoy Etrog is to add a bit of it to a glass of chilled champagne -- easy to make and very elegant! To find Sukkah Hill Spirits near you, check out their Store Locator. (7) Ready to Bake Pouch Batters. Love to bake, but don't have time to measure ingredients and dirty a bunch of pans? 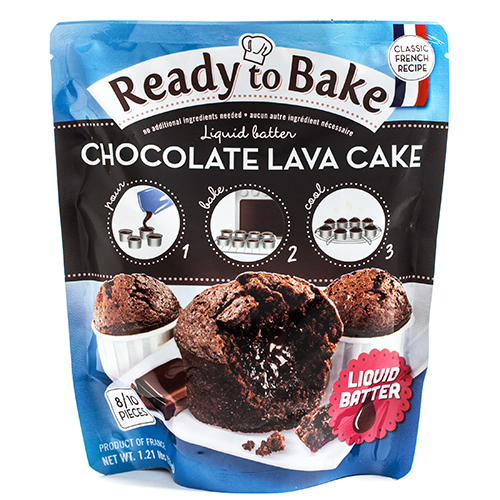 Look no further than Ready to Bake's ready-made pouch batters! This French company has done nearly all the work for you. Premium liquid batter is sealed inside the pouch. When you're ready to bake, simply open the pouch and pour it into your prepared pan. Bake as directed, and you've got a sweet treat in minutes. Ready to Bake products come in several flavors, and I can vouch that the Blueberry Muffins are delicious. I baked them up one weekend morning, and we had warm muffins with our brunch in less than 15 minutes! The muffins came out moist and flavorful, and the pre-made batter saved me a ton of time. Ready to Bake batters can be purchased online via iGourmet. (8) Crown Maple Bourbon Barrel Aged Maple Syrup. If you love pure maple syrup, Crown Maple's Bourbon Barrel Aged Maple Syrup will blow you away! Crown Maple's organic maple syrup is aged in bourbon barrels, which allows it to take on the barrel's bourbon flavor. After aging, this amazing limited-edition maple syrup is bottled in upstate New York. It should be noted that this aging process does cause the syrup to contain up to 2% alcohol -- making this an adults-only indulgence. This maple syrup is rich and complex, with subtle bourbon notes. 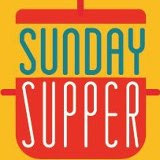 I have it earmarked to create a flavorful Bananas Foster topping for waffles, and I'll be sharing the recipe very soon! Crown Maple's Bourbon Barrel Aged Maple Syrup -- and all of their richly flavored maple syrups -- are available at select retailers nationwide. Their products can also be purchased at their website. Disclosure: The makers of the products featured provided me with samples to facilitate inclusion. I only feature and recommend items that I have tried myself and love. All opinions expressed are solely mine.